Prêt-à-Portea adds a creative twist to the classic elements of the traditional English afternoon tea with cakes and pastries inspired by the latest catwalk designs (The Berkeley’s pastry chefs visit London fashion week shows to get their inspiration for the colours and the textures of the new collections). All are served on a bespoke collection of Paul Smith fine china. The dazzling Palm Court is famed as the place where the tradition of afternoon tea was born over 140 years ago, an indulgence that lives on today as Tiffin at The Langham. All day light dining is served with timeless elegance and as the work day becomes evening time, the change of day can be celebrated with your choice of your favourite fizz from an extensive Champagne list and served in a striking bespoke coupe glass. 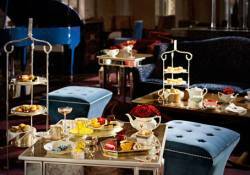 On 10 June 2014, Palm Court is offering guests Afternoon Tea for the original price it was served in 1865, marking the hotel’s 149th birthday. 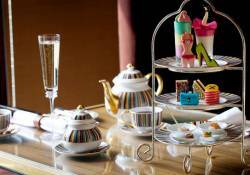 For just seven pence, guests will be able to experience the Wonderland Tea, normally priced at £44. If scones and sandwiches don’t take your fancy, book yourself into The Oxo Tower Brasserie for their deliciously different afternoon tea. The menu offers four dessert tasting plates, expertly matched with cocktails created by the bar team. Choose from Kent Orchard, Taywell Preserved, Tropical Delight and, our favourite, Nuts about Chocolate – a die to for chocolate, orange and almond fondant, peanut and milk chocolate slice, bitter chocolate and pecan tart, hazelnut macaroons and white chocolate ganache which works well when accompanied with an almond mulata (Havana Especial rum shaken with almond syrup and chocolate liqueur). 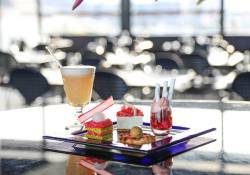 The decadent desserts and drinks can be enjoyed along with the Oxo’s breathtaking riverside views. 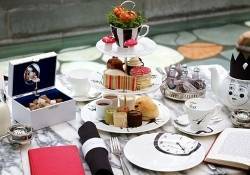 Haute Living’s favourite mid afternoon spread is arguably The Sanderson’s Mad Hatter’s tea. Guests are invited to “tumble down the rabbit hole” and enjoy a number of Alice inspired gastronomic adventures in the enchanting courtyard garden. Don’t miss the ‘Eat Me’ Queen of Hearts (strawberry and cream mousse) and ‘Drink Me’, a beautiful bottle packed with passion fruit jelly, coconut panna cotta and exotic foam. It sounds weird, but it works! Other treats for the taste buds include Blueberry lollipops that turn tongues from hot to cold and Hazelnut praline ice cream lollipops which explode with a single bite. The Ritz-Carlton is graciousness itself. 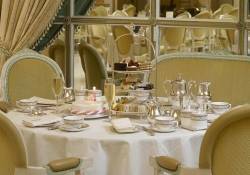 Their excellent old style afternoon tea is served in the iconic Palm Court; expect the full panoply of silver teapots, tip top pastries, crustless sandwiches and scones served on a three tier stand. If you can’t wait for cocktail hour, take the champagne package (£54) with flutes of bubbly to accompany your fantastic freshly baked scones.